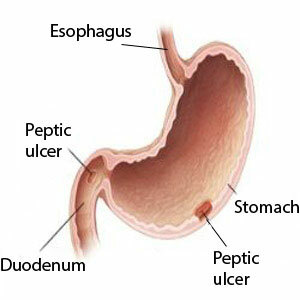 Peptic ulcer disease (PUD) refers to open sores that appear on the mucous layer of the esophagus, stomach and duodenum (the upper part of the small intestine). Esophageal ulcers – these ulcers are usually located in the distal part of the esophagus and caused by the corrosive influence of stomach acid acting on the unprotected mucous membrane of the esophagus. Duodenal ulcers – can occur in the duodenal bulb (part of the duodenum that is closest to the stomach); post bulbar region, proximal and distal parts of the duodenum. Dyspeptic symptoms are a lot less common for duodenal ulcer and the pain syndrome is slightly different, which will be described below. Ulcers of Meckel’s diverticulum (a slight bulge in the ileum - distal part of the small intestine) - tend to progress rather quickly with the most common symptoms being pain and intestinal bleeding. Often perforation of the ulcer is the first symptom that occurs while the rest of the symptoms pass unnoticed.